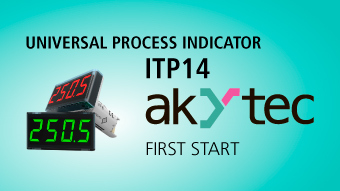 The ITP14is a universally-applicable process display for monitoring and control of industrial processes. It has an analog input for voltage signals (0–10 V) or current signals (4–20 mA and others). It also has an NPN transistor output to control a load up to 42 V DC / 200 mA and to implement ON/OFF control. The potential groups (analog input, output, power supply) have galvanic isolation from each other.